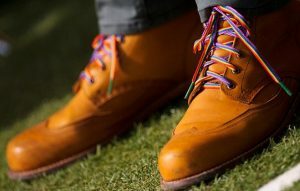 For many footballers and rugby players, the Rainbow Laces campaign for LGBT inclusion in sport has previously presented a dilemma that’s not been about morals, but materials, writes Jon Holmes. As the campaign returns to the public consciousness this coming weekend for the start of nine days of action across the UK, those in dressing rooms preparing to take the field will likely ask themselves – are the standard-issue rainbow laces still too ‘chunky’ for a modern boot? It might seem a minor grievance in the overall context, but it’s a valid question. Favoured sports equipment is often considered sacrosanct, even down to this level of detail. In this case, the consistency of a perfectionist’s routine trumps the chance to champion a cause, however worthy or charitable. Helpfully, football’s governing bodies and clubs have by now largely clocked this problem, and addressed it with additional matchday rainbow rebranding. Captains’ armbands, corner flags, ball plinths, advertising hoardings, handshake and timing boards… Premier League, EFL and SPFL fixtures this coming weekend will not want for visibility. Taking a little pressure off male players to be responsible for activating the campaign is no bad thing, either; they shouldn’t be made to feel uncaring here simply for favouring a thinner lace to tie up the tools of their trade. Maybe the big sportswear brands will have engineered a solution this time around; we await developments. But as the campaign enters its fifth year, it’s a sign of its strength that it’s not limited to just the laces. That’s also good news for sports reporters and their editors, with their footwear shielded in cramped press boxes or tucked under desks back in newsrooms. Having a double-bow rainbow on the tops of their shoes might seem like a lost gesture in those circumstances. Now, with considerably more rainbow-related visibility around stadiums, it’s so hard to miss that not mentioning it in copy or commentary would seem odd. 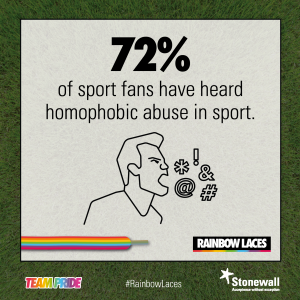 The EFL encountered no difficulties in obtaining the help of players to promote their support for Stonewall’s Rainbow Laces campaign. 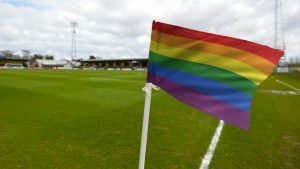 Mark Noble, the West Ham United captain, eight players from the EFL and referee Kevin Friend have posed for a photograph to publicise next weekend’s campaign, which will include rainbow-coloured corner flags at every EFL match in a show of solidarity with LGBT players, fans and staff. Furthermore, you’d struggle to find a half-decent sports media title or organisation that had recently failed to cover any of the plans afoot to activate the campaign. At the very least, it’s newsworthy – sport is collectively doing something different, in order to show solidarity with a diversity group. It also means people are already talking about Rainbow Laces, and thousands, maybe even millions, will see, hear and discuss the campaign by the first weekend of December. If you’re LGBT or an ally and you love sport, this is obviously rather exciting. For those of us in the media, it’s also an opportunity to show that our profession is helping, not hindering, even if the front pages of the tabloids occasionally give the opposite impression. So how do you measure success? Well, there is a realistic pot of gold at the end of this particular rainbow. But it won’t be a woman who works in rugby who happens to be lesbian or bi feeling more accepted for a weekend. It won’t be transgender people seeing an all-too-rare positive depiction of themselves in the media, sports or otherwise. It certainly won’t be a gay male footballer coming out. That’s because any warm, fuzzy glow of reward after all this activity shouldn’t be exclusively for the benefit of LGBT people. It’s why allies in sports media are so critical to achieving true LGBT inclusion in sport. By presenting not only relevant statistics that explain the key issues, but also the real-life experiences of those affected – gay or straight, cis or trans – journalists and broadcasters can lift the campaign far above boots and shoes level, and into hearts and minds. For too long, fear of saying ‘the wrong thing’ has prevented this – but bravery in all things LGBT and sport is not exclusive to Billie Jean King, Gareth Thomas, Tom Daley, Robbie Rogers, the football supporters who set up LGBT fan groups, or anyone who comes to the conclusion that life is better when you know your true self, and allow others to know your true self too. The most effective weapon in any fight against discrimination is education – words wielded with precision and understanding. Our best writers and broadcasters command the language to explain why Rainbow Laces is about more than just one weekend’s colourful makeover. Some parts of that picture are complex, but if time or space is short, a simple statement of fact will suffice – that it’s OK to be gay, lesbian, bi or trans in sport. It doesn’t yet go without saying, so for sport’s sake, speak up – our great games are too special not to be enjoyed by everyone. You can now buy Rainbow Laces at Stonewall’s new shop on eBay.